After nearly a year, I finally gave in to the good reviews of getting lash extensions. This explains the luscious lashes that I have been sporting in my 2 previous posts. I've been passing by I-lash Salon at SM Supercenter (also known as SM Hypermart) beside Tiendesitas, for nearly a year now. When I visit our used to be drug testing center there or when I do my grocery, I notice a good following of clients because they never ran out of customers. I was insanely curious but had a lot of apprehensions. So last week at around 9pm, I came and surrendered myself to the capable hands of their people. I got the Natural effect (php800.00) that consist of 160 extension. The length that was applied was medium (10mm), a lot longer than my normal lashes. I was asked to lay down on one of the most comfortable bed-like furniture that had the softest cushion. An ottoman was provided to support my leg as well. My mascara was then carefully removed before the actual procedure. The lower part of your eyes are immediately covered to act as protector from any of the makeup remover or glue to get into the yes. Also, the way they cover your lower lid in I lash was more exceptional than any that I've experienced in lash perming. The application seems so easy after that. Each extension was applied with the help of a high grade medical glue and distributed among my lashes to create that Natural effect. I felt how meticulous their aesthetician was since she made sure that the lashes fanned out and distributed equally among my eyelids. After nearly 2 hours of procedure, I immediately saw the difference. I was like a new person. My eyes didn't look so droopy anymore, it looked wide awake. More than that, I looked way younger than my actual age. LOL. Suffice it to say, I love it! The only downside was that the glue was a bit stingy (this is normal) and the strong smell of the fumes may irritate some through out the procedure. On my next visit, I will make sure to bring a mask from the leftover stash I had during the AH1N1 scare. I also experienced the slight red eyes due to the fume which was easily remedied with an artifical tear dropper (like Eye-mo or Visine). All of this are normal, I was told by I lash. Four days from the procedure, I'm one happy I-lash client that would surely make time to get my lashes retouched or get the Mascara effect. Hehehe! But why get lash extensions anyway? If you are like me who is curious with anything about beauty, this is a must try. If you don't like mascaras and liners especially removing them, this is for you. If you want to enhance your look without taking much time prepping up, yes, this is for you. If you want to look good despite the lack of sleep, these lash extension will provide exactly that. How does one maintain it? 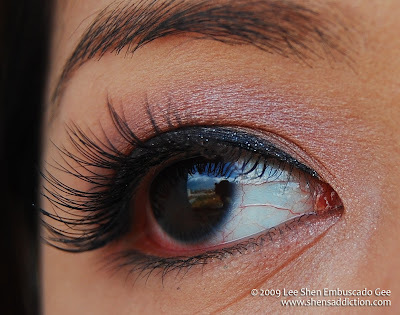 I Lash will provide an after care instruction that you should follow. You can't rub or tug your eyes anymore. When removing eye makeup especially liners, use cotton buds to avoid tugging your lashes. When washing your face, be extra careful around the eye area. Immediately pat dry your lashes and fan them out to their original places. 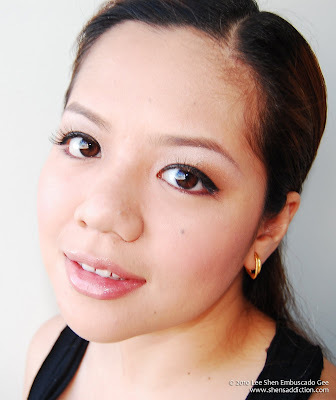 I still use my regular eye makeup over (L'oreal Gentle Eye and Lip Makeup Remover) and experience no fall out. I notice that having these lash extensions allow me to care for my eye area more. This help avoid those unsightly wrinkles and crows feet. So if there's one reason I'm getting this done again (aside from the fact that it makes me look good. hehehe! ), it would be because of that. And the price isn't all that bad considering that their people are all professionally trained. 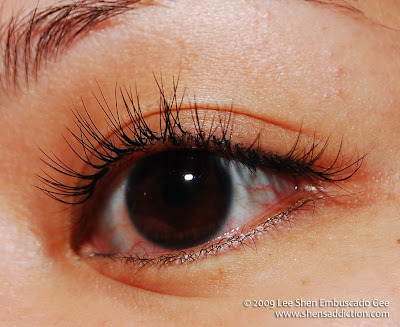 You lash extensions should last about two months with proper maintenance. If you add weekly retouch to that, it would last a lot longer. Retouch service are available at I-lash Salons. How much does an I-lash Extension cost? You may also see I-lash's FAQ at this site. After care intrusction is also available there. Click here. fabulous! hate the extra care/ maintenance part though,.